Cathy Wilder (PhD, MEd, RCC, Dip.C) is the founder of Creative Connections, which provides coaching practice and counseling services aimed at enhancing her client’s personal, relational and business well-being. She emphasizes the vital importance of “slowing down” and integrating body wisdom with the intelligence of mind, leading to personal transformation and meaningful communication. 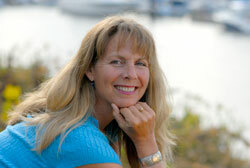 Cathy developed her coaching practice in Toronto in the 1980’s while working primarily with Ontario Hydro employees. Her love of the outdoors – particularly kayaking and skiing – led her to BC in 1991, where she also discovered The Haven. “I recognized the value and wonder of the Haven approach,” she says, and since that time she has integrated Haven’s models and concepts into her work with individuals, couples and business teams in BC, China and South America. Cathy is a core faculty member at The Haven, with a highly intuitive, creative approach to her work who has established a reputation as a deep, respectful, compassionate listener and program leader who offers gentle strength, direct feedback and a commitment to holding others to be whole and resourceful. For those walking a path of recovery from substance use or other addiction processes, clients report finding strength, clarity and encouragement in Cathy's more than 20 years of specialized time, with hundreds of individuals establishing news ways of engaging and being in their lives. "What makes Cathy an exceptional therapist, is she feels what is going on. She quickly moves me out of my head, into my body and gets to the heart of the issue."